In the picture from left to right are Paul Geswindt (Director: Alumni Relations), Liscka Hendricks (Alumni Officer and Newsletter Compiler) and Randall Jonas (President: Alumni Association). 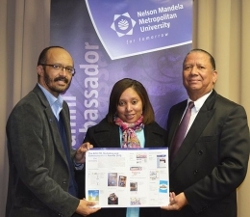 Nelson Mandela Metropolitan University’s (NMMU) alumni on-line publication Alumni News has won an international public relations award. The online cost-effective newsletter that is distributed to NMMU alumni around the globe took top spot in the newsletters and magazines category of the Association of Commonwealth Universities (ACU) annual PR Awards. The annual print publication Routes is also available online. The ACU, the world’s first and oldest international university network, has over 500 member institutions in developed and developing countries across the Commonwealth. The ACU seeks to address issues in international higher education through a range of projects, networks and events. NMMU has more than 90 000 alumni.